Groundswell Technologies has partnered with Hartman Environmental Geoscience to deliver the industry's first cost effective near real time vapor intrusion monitoring and response solution - VaporSafe™. VaporSafe™ immediately identifies trends, encroachment/entry points, cause-and-effect, indoor sources and determines whether mitigation options are required or if a reading was due to a foreign source brought into the location. VaporSafe is ideal for mitigation confirmation and adaptive remediation strategies. This solution enables response in minutes, not days or weeks, and is competitively priced in comparision with time integrated methods. Our Projects Page shows a sample of VaporSafe™ Projects and the benefits provided to our clients. Highly accurate and sensitive laboratory grade equipment (Modified EPA Method TO-14A) integrated with our web based dashboard for visualization, alerting and data export to Excel. Contact us if you have any other compounds of interest. See how VaporSafe™ compares with other methods. Additional parameters such as Differential Pressure, Barometric Pressure, Indoor Pressure, and Temperature are optionally available and automatically merged with the collected data. Remote device control of HVAC and SSD is also available. 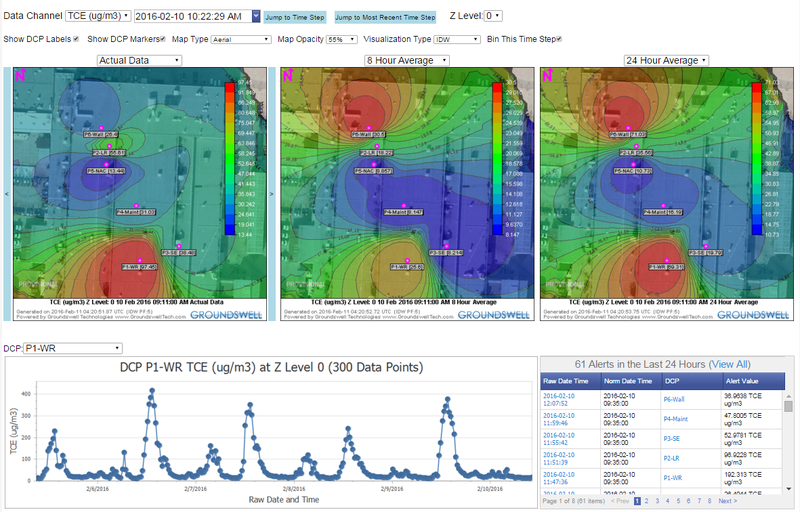 VaporSafe™ can help you determine the effectiveness of remediation as well as optimize remediation efforts while monitoring multiple locations. The complete turnkey service (hardware/telemetry/web portal/deployment/calibration) can be implemented on a rental basis (daily/weekly/monthly) for site assessment and characterization or as part of an overall remediation solution. Complete setup by our personnel typically takes one day. Contact us to learn how to get started with VaporSafe™.